Planning a kitchen garden? Traditionally, these gardens were separate from formal parts of a house’s outdoor space and often in a walled garden to protect the produce from harsh weather and scavengers. Potagers, or ornamental kitchen gardens, were popularised during the French Renaissance, with edible and non-edible flowers planted alongside vegetables, and the gardens laid out in a pleasing and practical way. Today, they're just as popular – if on a smaller scale. So, whether your garden is large and your plans ambitious, or it's small and you are planning for a modest yield, be inspired by these seven kitchen gardens, all of which show how growing your own fruit and vegetables can be incorporated into any garden design scheme. Get more practical tips in our guide to planning a kitchen garden. Set within a three-and-a-half-acre country plot, this garden is filled with a glorious array of plants with different colours, scents and flavours in late summer, which would inspire anyone to grab their trowel and start growing their own food with enthusiasm. Find out how to troubleshoot growing your own in our Q&A with horticulturalist Matt James. Within the garden, owner Sandra Blaza operates a system of crop rotation, so that each main group of vegetables – brassica, potatoes, onions, root vegetables, and legumes – is grown in a different spot each year. An interesting feature of the garden is the inclusion of half-standard gooseberry and currant bushes in the corners of these vegetable beds. This unusual way of growing and training soft fruit adds height and structure, and shows off the fruit to great effect. Find out how to choose the right plants for your garden with our advice. Among the relaxed planting of this traditional cottage garden in Hampshire, there is a beautiful terraced kitchen garden. Sweet peas, alstroemeria and foxtail lilies add an injection of colour to the area and thrive alongside an old clump of delphiniums. In the lower beds, the home owner Penny grows soft fruit, blackberries and raspberries, while broccoli, onions, parsnips, beans, potatoes and lettuces make up the vegetable beds. If you’d love to transform your our outdoor space into a cottage garden, take a look at our expert advice on how to create a cottage garden. While this is mainly a family garden, owner Joanne Winn has developed a productive kitchen garden that is her private area to withdraw to. It is a sunny patch, with raised beds containing vegetables and soft fruit, and there is a small greenhouse. This is Joanne’s favourite spot, where she’s most likely to be found, even in the depths of winter. ‘It’s my haven, I suppose. I love its calm serenity and feeling of enclosure,’ she says. Find out how to buy the right greenhouse in our guide. Herbs, potatoes, onions and salad leaves thrive in the secluded little patch, whilst a beautiful calendula plant acts as a companion, bringing in insects and wildlife to keep the kitchen garden producing. Follow our advice on how to create your own luscious wildlife garden. And, did you know that if you grow organic you'll be helping wildlife too? Find out how to grow organic fruit and vegetables in our guide. 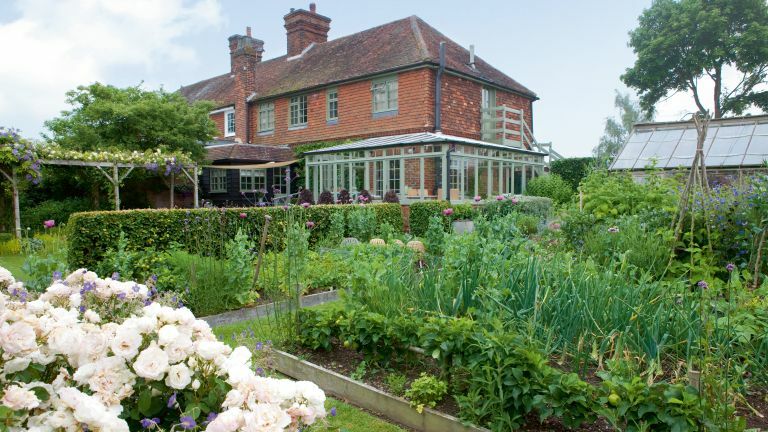 The owner of this garden, Barbara Jeremiah, is the Liveryman for the Worshipful Company of Gardeners, so it is no surprise that her kitchen garden is outstanding. A raised fruit bed and vegetable plot offer a variety of produce, and are backed by espaliered ‘Charles Ross’ and russet apple trees. In late summer, artist Lizzie Smith’s garden is at its zenith, with a cornucopia of vegetables in raised beds ready for harvest, billowing flowers to cut and the herbaceous beds filled out with golden Rudbeckia fulgida var. sullivantii ‘Goldsturm’, Nepeta ‘Six Hills Giant’ and Cynara cardunculus, or cardoons. ‘Our wish was to develop a productive, beautiful and creative garden for our family, friends and wildlife to enjoy being in and eating from. We have six children between us, so the garden is a great source of fresh vegetables and flowers, with lovely places to be in,’ says Lizzie. The variety of produce is impressive, from herbs such as mint, rosemary, thyme and parsley at the front door, to tactile Cavolo Nero mixed with ornamental Cerinthe major ‘Purpurascens’ kept in check in the woven-edged beds, or ripening Victoria plums heavy on the bough. There is something edible in nearly every corner of the garden. The kitchen aspect of this garden isn’t the most obvious part. In fact it is used to punctuate the relaxed and colourful traditional planting scheme. Neat rows of salad and root vegetables sit between repeated box-balls and have all been hand grown by home owner Heather Scott from seed. The tiny greenhouse is home to Heather’s young potted plants and vegetables, before they can graduate into the main garden, to complement the beds. Find out how to choose plants for traditional gardnes. Having created a beautiful garden for her family, Victoria Inglis turned her attention to creating a small potager outside their potting shed, which is enclosed in woven hazel fences. ‘My husband and three children are quite “foodie”, so we enjoy cooking at home with our own produce. Raised beds made from wooden planks are filled with salad leaves, rhubarb, beans and root vegetables,’ says Victoria. Choose the very best garden shed with the help of our buyer's guide. To finish off the kitchen garden, Victoria extended the small eating area on the south-easterly corner of the potting shed, and built a pergola, creating the perfect outdoor dining area to complement the productive kitchen garden. We have more beautiful outdoor dining spaces for your to browse.